With Height Maps, we can define the height of the terrain using greyscale images. Every world starts off with a height map, you may want to start with a flat map, or choose one of the more hilly ones. Of course, you can create your own! You can Import/Export the height map at any time with these buttons. A height map defines different terrain heights using colors. If you are planning on creating a hilly or mountainous world, starting with a height map is ideal, as it saves you a lot of time with the terrain tools themselves. You can make a height map in any graphics program that can save as .png format. The image must be square in shape, with lengths either 256, 512, 1024 or 2048. The scale of your height map relivant to the game and Create a World is 1 pixel = 1 in game square. Read through the information below for more help. RGB is a way of defining colors using three numbers: Red, Green and Blue. When entering a RGB Value for your height map, it must be the same number for Red, Green and Blue. The Y Value is the height of the terrain once imported into Create a World. What a Height Map looks like. A height map must be in complete greyscale. Here is some information about what different shades you put into your height map will do. Black & White A height map uses colours to tell Create a World what height the terrain needs to be. Black (RGB 0) is the lowest point of the map, where Y value will be 0. White (RGB 256) is the highest point of the map. This can be either Y Value 100, 200 or 300 depending on what your corresponding maximum height is. Greys In-Between Any grey’s in between Black and White will come out as other heights. For example, a 50% Grey (RGB 128 – this is exactly ½ way between black and white) will come out as half way between the minimum and the maximum. You are able to create the exact Create a World Y Value you want by defining an exact RGB colour value on your height map. This is useful for creating maps from topographical maps, allowing you to create exact reproduction of real places. You need different sets of numbers depending on the Maximum Height of your map. You need different height increment values, depending on the maximum height of your map. If you use the incorrect one, it will not work! To work out what RGB value, you must do the following equation. Take the Correct Height Increment Value from the table below. 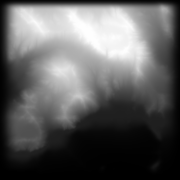 So I shade the region on my Height Map with grey of RGB value, which is 107.